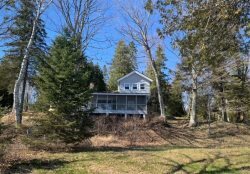 Lakefront cottage, with a view of Chebomnicon, "Russell", Bay and Michigan's Porcupine Mountains. This 3 bedroom cottage offers all the amenities you could need, including A/C! Relax on the furnished deck while listening to the sounds of the lake and the woods, or stroll across Middle Road to the sandy beach where you can search for a Lake Superior Agate, splash in the pure fresh water, or sun on the sandy beach. Just a short drive to town in one direction, or Big Bay State and Town Parks in the other, this cottage is an ideal summer vacation destination for a family or small group of friends.